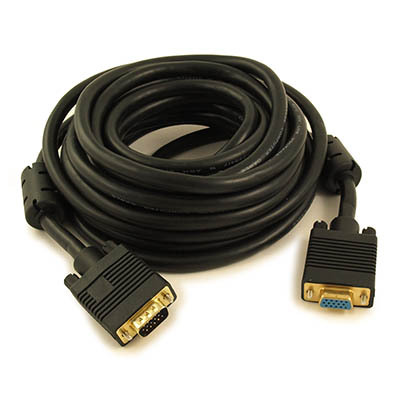 This VGA EXTENSION cable features a low loss, double shielded design. Signal integrity is further enhanced by ferrites cores that filters out noise. Comes with durable molded connectors with thumbscrews (at both male and female end) for a secure connection. 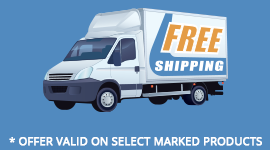 Great for connecting high resolution analog displays. Comes with a lifetime warranty for peace of mind. 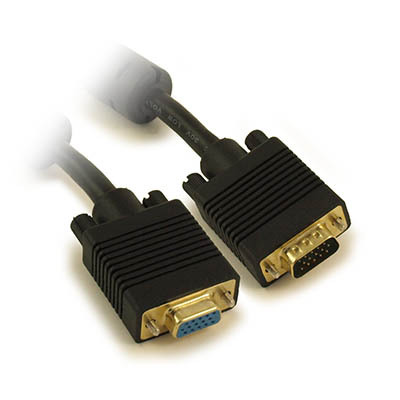 1 Male, 1 Female 15pin connection, VGA connections are also commonly referred to as HD15, DB15 (a misnomer), PC in/out, RGB and RGBHV. This is a FULLY PINNED, FULLY WIRED (15 wires) cable for full DDC2/E-DDC support. All 15 wires connected "straight through"
Supports resolutions UP TO 2048X1536px @85 Hz (388 MHz). Max Resolution obtained may vary depending on signal strength and cable length.